In the very heart of the town, this park was named after an adopted son of Manises who for more than 20 years and until his death in 2003 was President of the Municipal Wellbeing Club, 9th October. 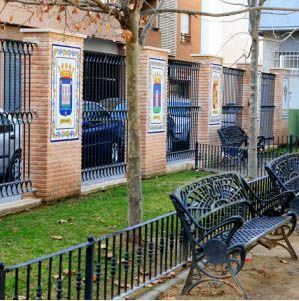 Manises Town Council recuperated this park of 1.500 square metres and dedicated it to him for the incessant concern and interest that Navarro Pradillos showed at all times in matters to do with integration in our town of people from other provinces. On the wall surrounding the park, ceramic panels contain a representation of all the shields of the different capitals of provinces of Spain, in addition to those of Manises and of the Spanish State. These panels are the work of Jesús Royo.